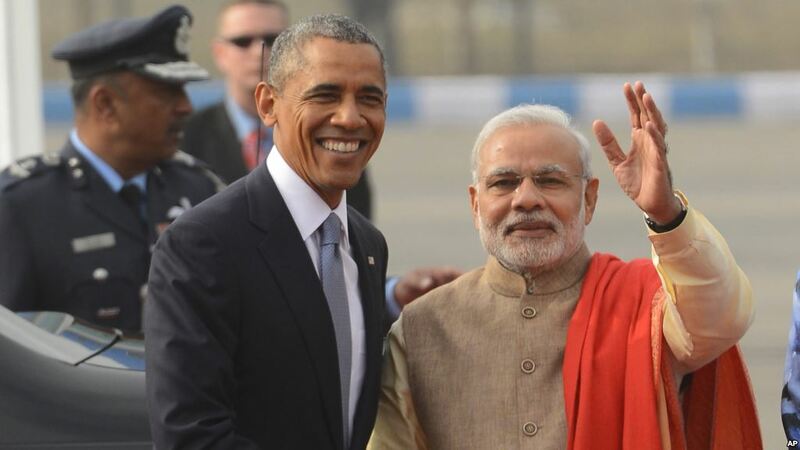 The U.S. President Barack Obama has cut short his trip to India and taken off to Saudi Arabia to condole the Saudi government over the demise of late King Abdullah bin Abdul Aziz, and to meet with new King Salman bin Abdul Aziz. Obama scrapped earlier plans to visit the Taj Mahal on Tuesday, and jetted out to Riyadh after holding talks with India over future bilateral relationships. Obama will be joined by a large contingent of US delegation to pay its respects to the Saudi royal family in its time of grief. The president and King Salman will introduce their delegations at Erga Palace, after which the two heads of state will hold a bilateral talk and then have dinner together. US Secretary of State John F. Kerry is also rounding off a week-long trip overseas to join with Obama in Riyadh. He is flying early Tuesday morning to Ramstein Air Base in Germany where he will be joined with a large spectrum of American political and national security officers for the trip to Saudi Arabia. This entourage will include current and former members of Congress and national security advisers as well as past secretaries of state. Saudi Arabia is a strong ally of the United States in the fight against religious extremism in Syria and Iraq, and they have joined the fight against the Islamic State militants – with Prince Khaled bin Salman, a pilot and the son of present King Salman conducting air strikes against extremist positions in Syria last year. Saudi Arabia also fights al-Qaeda in the Arabian Peninsula and in Yemen, and even sent warplanes to fight the ISIS group in Iraq and Syria. Gen. Lloyd J. Austin III, commander of U.S. Central Command; Brian Deese, deputy director of the Office of Management and Budget; White House press secretary Josh Earnest; Anita Breckenridge, deputy chief of staff for operations; Tina Tchen, chief of staff to the first lady; Chase Cushman, director of scheduling; Peter A. Selfridge, chief of protocol; and Melissa Winter, deputy chief of staff to the first lady.